AMCN has sprung Triumph’s testbed for a future Daytona 765, using the latest 765cc three-cylinder engine from the Street Triple 765 rather than the old 675cc motor, but while the bike looks like it’s ready to roll out of a showroom, this is likely to be a toe-in-the-water prototype rather than a pre-production prototype. Because, other than the engine covers, the addition of a megaphone-style silencer bolted to the standard Daytona 675’s front exhaust section which mimicks the end can of the Moto2 development bike, virtually every other respect the spied prototype is identical to the old Daytona 675R. The frame, the Öhlins suspension – NIX30 forks and TTX36 rear shock – the bodywork, subframe and swingarm are all straight from the old bike. It’s all good stuff, but it’s unlikely Triumph, which recently is on a roll in terms of high technology and on-point styling, would introduce a new model without more substantial updates. When the Street Triple made the transition from 675 to 765 in January 2017, the engine might have garnered headlines but it was just part of the package. There was a new frame, bodywork, lights and swingarm in the mix, too, along with a big update in electronics. If the Daytona is to re-emerge, the same is likely to apply. That means this bike is likely to be a proof-of-concept prototype, put together from existing bits to see how well the 765cc engine, which will need to comply with next-gen Euro 5 emissions laws, works in the context of an out-and-out sportsbike. In performance terms, it’s likely to be similar to the old bike. The highest-spec ‘RS’ version of the Street Triple 765 makes 90.4kW, compared to 94kW for the old Daytona 675 which had easier emissions targets to hit, but the new engine is torquier with 77Nm instead of 74Nm. 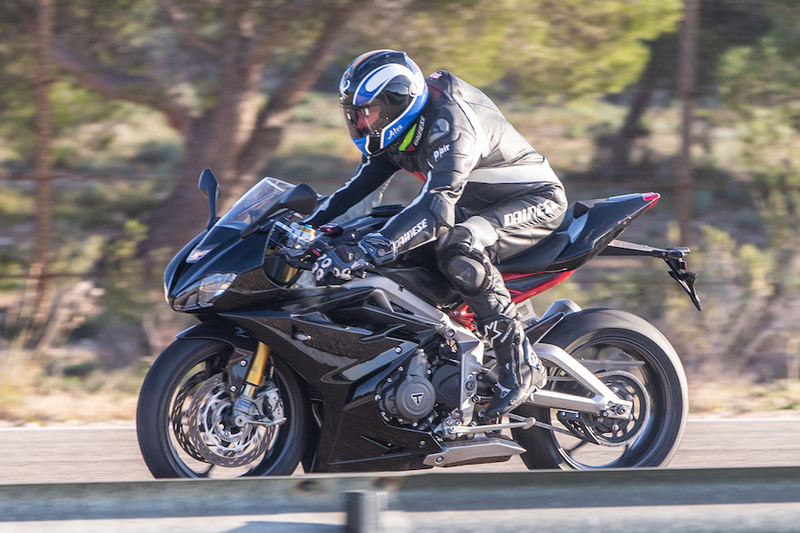 With the demise of the Daytona 675, Triumph has been left without a Daytona-branded sportsbike in its range for the first time since 1991. And while its current line-up is strong, it’s also limited to three main ranges – retro bikes, adventure bikes and naked sports models. While interest in sportsbikes might be waing, the fickle finger of fashion could turn again. Upcoming new middleweight sportbikes like Aprilia’s RS660 twin, Norton’s 650 Superlight and MV Agusta’s Superveloce 800 could be the spark to reignite the sector, and Triumph will want in. What’s more, the engine is powering Moto2 racebikes for the next three years, so it makes sense to capitalise on the publicity. Those arguing against a new Daytona 765 need only point out one thing: sales. The supersport market has been in what appears to be a terminal decline for years, and it’s going to be hard to justify significant investment without being able to show that a turnaround is coming. However, as the reborn Rocket III that was revealed last month shows, Triumph is prepared to take a risk even on models that have historically sold slowly. Even if the prototype seen in these pictures doesn’t turn into a production bike in this form, it could be vitally important in persuading Triumph bosses to green light something even more exciting.